"Rupert Murdoch's wife Wendi may be on the board of MySpace China, but the way the new venture's CEO tells it, the famously interventionist News Corp mogul will play next to no role in how it is run." "Baidu.com Inc., China's Internet search leader, said first-quarter net profit more than doubled on strong traffic growth and higher advertising revenues." "Can anything stop Robin Li? A lot of people in China are probably asking themselves that question today..."
"Google has 21.7 percent of China's search market, well behind industry leader Baidu.com Inc., which has 55 percent.."
Armstrong on Obama: "I find his non-existent online outreach strategy very pre-2003, and you are free to defend it. Just don't mimic the latest about how Obama is the new Reagan, because the latter knew how to work with his base." "If the numbers pick up in China, this could skew most popular blogs, videos, and so on on MySpace. Hard to say what will happen." "Google Inc., the second-largest Internet search engine in China, aims to become the market leader there, as it gives local management more authority, Chief Executive Eric Schmidt said Friday." " In this day and age, it's no longer sufficient to just watch a presidential debate on television. You should also be able to upload it, YouTube it, share it, splice it, and 'remix' it online." "Google and MySpace are increasing their efforts to establish themselves in China, the second-largest Internet market behind the United States." "Clinton's eloquent speech impressed the convention, but Obama, the Illinois senator, sent shockwaves of excitement rippling through the hall filled with delegates and volunteers waving "Obama" placards." "In a departure from the way other big foreign Internet companies have entered China, MySpace China will be run by a Chinese company that is controlled by local management"
"it is sure that Feedburner will not neglect potential Chinese market. However, unlike in other market, they need to face a great challenger in China, that’s Feedsky, a big name in China’s rss management market." "It is not clear why MySpace China will be successful. They don't seem to have anything special to offer, and they are late to join an already crowded field." "Foreign Internet companies have also struggled to find the right balance between complying with China's stringent censorship--sometimes having their sites blocked in China--and providing enough interesting content to attract users." billsdue: How Will MySpace China Deal With Local Content Rules? The Korean blogosphere has been obsessing about the V.T. shooting. Click here to find out what some of them have been saying. Mutant Palm: "Splittists" to Rupert Murdoch: Thanks for the Addy! Dave makes some rather fascinating discoveries about censoship on Chinese MySpace. He concludes: "Uh, Rupert and Wendi? Good frackin' luck. This will just burn either way guys." "the Securities and Exchange Commission has rejected a request from Yahoo to "omit" a shareholder resolution proposed by those funds, to have Yahoo adopt anti-censorship policies." "Google Inc. won the right to sell advertising on 400 Web sites owned by China Telecom Corp., helping the company compete with Microsoft Corp. and Baidu.com Inc. in the world's second-biggest Internet market." "Venture capital firm Kleiner Perkins is opening up shop in China. The Chinese government is offering tax incentives in an effort to bulk up the nation's scrawny technology sector, so the timing could be right." "Rule #1: A blog isn’t a publication. It’s a person. The thing about blogs is that the most interesting ones are interesting because of the people who write them and the people who read them." ...knocking off Microsoft for number one. Interestingly China Mobile is the world's number 5. "Popular Chinese blogger Wang Xiaofeng hosted a face to face meeting to his fans ..."
"Drafting a new licensing rule for online magazines is on the agenda of China’s administration of press and publication, which will require online magazines to obtain license from the government before publishing, China Business News reported." "China's chief censor has been been removed from his post, state media reported Tuesday, following an outcry this year over a reported decision to ban eight books." "Chinese President Hu Jintao on Monday launched a campaign to rid the country's sprawling Internet of "unhealthy" content and make it a springboard for Communist Party doctrine, state television reported." "I want a checkbox that tells MSNBC that I don't want any more Virginia Tech stories." Digital Copyright: What is really in the Hong Kong people's interest? The Hong Kong government's consultation period on proposed changes to Hong Kong's digital copyright law is winding down. The last day for submissions is on April 30th. InMedia Hong Kong is calling for more people to make their voices heard. The South China Morning Post reported on Sunday that only 182 responses to the government consultation paper have been submitted. Five from organizations and 177 from individuals. InMedia and OpenKnowledge are calling on the government to re-do the consultation. Why? Because not enough has been done to solicit public response. Their position paper can be downloaded in Chinese as a PDF here. Among other things, they call for the government to include consideration of flexible copyright systems (like Creative Commons) and the concept of fair use in a revised consultation. They are also opposed to the criminalization of downloading by individuals, nonprofits, and educational institutions. Meanwhile, here in academia land we are preparing out own submission. Intellectual property law professor Peter Yu and Charles Mok, head of the Hong Kong Internet Society, spoke at a seminar here at Hong Kong University last Thursday. They pointed to a lot of ways in which the proposed legal changes would be potentially harmful to freedom of expression in Hong Kong. In his talk last week, Peter made a strong case that the people of Hong Kong should be concerned about over-enthusiastic emulation of the DMCA. In the U.S. the DMCA has been prone to intentional abuse by those who want to silence critics and whistle-blowers. (For details read this PDF document.) Peter pointed to specific cases in which companies have abused the DMCA to get service providers to take down content that was simply critical of them or which advertised competitive pricing, wrongfully claiming copyright violation in order to get the content removed. How do we guard against companies here in Hong Kong doing the same thing to use copyright as an excuse to silence critical consumer groups? What's more, copying the DMCA too closely here in Hong Kong could result not only in companies, but also other powerful "copyright holding entities" (which is pretty much anybody) using exaggerated allegations of copyright violation to silence speech they don't like. How will the Hong Kong government prevent such abuses? The consultation document does not say. Another issue has to do with the consultation document's approach to criminal liability. He believes that the punishment needs to be more "proportional" to the actual harm committed. Which means that people who are file sharing and downloading for non-commercial reasons should not be treated in the same way as people who are doing so for direct financial benefit. Otherwise, you are turning most of Hong Kong's population technically into criminals, and certainly most of its young people. What are the consequences of this? Peter didn't say this outright, but a couple of questions arise in my mind, also unanswered by the consultation document: Might the existence of illegally obtained movies on the hard drive of a government critic be used as an excuse to put him in jail??? What about a journalist who does a hard-hitting, muckraking report? Might she get a call from somebody the night before it is published saying "Greetings. We have learned from your ISP that somebody using your home computer downloaded 100 songs illegally in the last month. (meaningful silence)...."
In Peter's view, copyright reform is not the only way to address the issues Hong Kong's entertainment industry faces. What's more, the digital environment should not just be defined as a commercial environment: it also includes digital lifestyle, access to knowledge, political discourse, and many other things. The government has an opportunity to take advantage of the Internet's promise - and the opportunities for innovation it affords. Not just approach it as a threat to some of Hong Kong's most vocal industries. Any new laws that do get passed need to be based "on empirical research rather than a leap of faith." More alternatives need to be explored. There is no upside to acting too hastily if you are taking the interests of all Hong Kong people to heart. 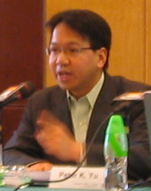 Charles Mok also emphasized that the consultation document does not adequately deal with protection of the rights of Internet users. Assuming the government here believes they should have some. People in Hong Kong should be entitled to fair use of material for educational purposes and also in the context of political and social criticism. He cites the UK's independent review of intellectual property, called the Gowers Review of Intellectual Property, which was much more comprehensive in the way that it addressed users' rights and the question of fair use. Mok points out that the entertainment industry in Hong Kong is one big cartel. Is it the Hong Kong government's job to protect its cartels? Or shouldn't its responsibility be more broadly towards the rights and long-term interests of the Hong Kong people? He also points out that if ISP's are required to retain more user data in order to help catch copyright violators, the possibility for abuse of that information also increases. "The more data you keep, the more likelihood of a screwup," he said. Indeed. InMedia and OpenKnowledge, plus some other groups, say they are planning to organize a collective submission action to the Commerce and Trade Bureau this Friday. If you are writing a submission yourself, they ask that you "cc:" it to openknowledghk AT gmail DOT com so that they can include it in the submission tally of critical responses. The organizers compared the proposal in the government digital copyright consultation as the notorious article 23 in Basic Law which led to half a milion people demonstration in 2003. The BBS forum is to share information concerning digital copyright issue and possible mobilization against the copyright legislation. "As YouTube, the Internet video-sharing service, generates millions of new fans in far-flung countries, it is making enemies of some of their governments." "Sending tweets broadcasts: "I am alive!" Reading tweets satisfies the craving of many people to know the smallest details of the lives of those they love." "The new censorship rules are often passed in vaguely worded measures and decrees that are ostensibly intended to protect the public." "Lifesterblog, in its alpha stage, is a new blogging community founded in Hong Kong and targeted to Hong Kong and Asia." China Brief from the Jamestown Foundation: China's Media Controls: Could Bloggers Make a Difference? "Even if this suit doesn’t go very far, it puts a lot of pressure on Yahoo! nonetheless. The company has a lot of explaining to do about its policies regarding human rights and user rights around the globe." A Chinese-language article published last fall is translated into English on Yeeyan. "Who is playing the most active role in boosting Korea's image around the world? The answer could be diverse but one of many plausible responses is Dennis Hwang, Google's head webmaster." China Herald: Has Google Pinyin been stolen from a competitor? "For six years, the Bush administration, aided by Justice Department political appointees, has pursued an aggressive legal effort to restrict voter turnout in key battleground states in ways that favor Republican political candidates..."
An awesome idea! PodCorps.org is "an all-volunteer team of audio/video producers who record and publish important spoken-word events anywhere in the world." "Doug’s idea is to create a corps of volunteer stringers who can show up at these events with their digital recorders, process the digital audio, and then publish it — typically at the Internet Archive." 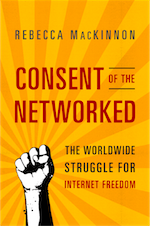 "As communicators - both private sector and public sector - attempt to understand the rapidly growing impact of the internet in China, I suggest this read taken from KNOWLEDGE WHARTON." "Yahoo China will change its name to China Yahoo after May 8, reports ChinaByte quoting Alibaba and Yahoo China insiders." 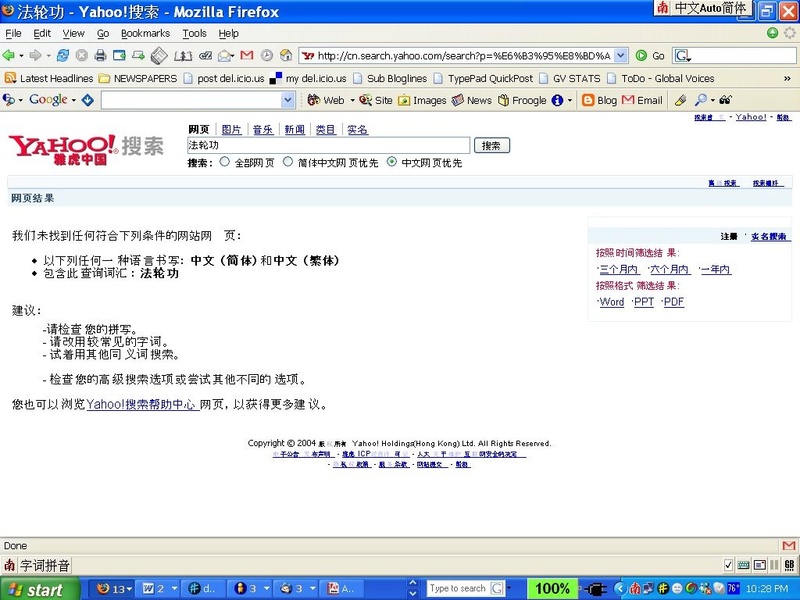 The original Chinese-language article about Yahoo! China's name change on ChinaByte. "A protester calling for free computer software and open source programming crashed a speech Friday by Microsoft Corp. Chairman Bill Gates at one of China's top universities." iYee in Shanghai has photos of the open source protester disrupting Bill Gates. It's not clear who took the photos. "It was a great picture and an irresistible story, but the saga of China’s nail house was more complicated than the media – Western and Chinese – let on. We can thank bloggers for digging into the reality." "First they commission a major profile of media mogul Rupert Murdoch’s young Chinese wife, then they spike the story. Could it be hazardous to upset Rupert down in Oz?" The lawsuit against Yahoo! being filed by the wife of jailed dissident Wang Xiaoning is being represented by Morton Sklar, Executive Director of a group called the World Organization for Human Rights USA. They have posted a full PDF file of their complaint against Yahoo! here. I have gone over it, and also gone over the Chinese language conviction of Wang, posted online in PDF form here and here. The World Organization for Human Rights USA, founded in 1996 as the World Organization Against Torture USA, is a non-governmental human rights organization dedicated to the prevention of torture and other human rights abuses. * Using litigation in U.S. courts as a primary means for bringing attention to compliance problems and for obtaining relief. They have recently issued a report titled "Torture by the United States" in which they argue that the U.S. Government "does not properly recognize its own responsibility for the pattern and practice of torture that has been taking place in the treatment of alleged terrorist detainees," etc. I have not read their report in full but I tend to agree with that statement. I cite this at length as evidence that this case is not a "China-bashing" exercise to make China or Chinese people look bad in contrast with the virtuous Americans. The Bush Administration has been very un-virtuous of late in my opinion. I feel the need to make this completely clear just in case anybody mistakes the motivations of this lawsuit, or my own motivations in criticizing the behavior of Yahoo! and others, especially given these kinds of comments - which I receive fairly regularly. human rights through their continued and expanded conduct of business in the PRC, the second- largest Internet market in the world with at least 110 million users. Defendants provided identifying information about the Plaintiffs, in violation of the privacy agreements and assurances made to the Defendants’ customers and users, that led to their arbitrary arrest, indefinite detention and torture, in order to obtain the approval and support of PRC officials and their agreement to allow them to continue conducting and expanding the Defendants’ business interests in the PRC. 39. The court specifically relied on evidence supplied by Defendants to identify and convict Wang Xiaoning. The judgment noted that Yahoo! HK informed investigators that a mainland China-based e-mail account ([email protected]) was used to set up Wang Xiaoning’s “aaabbbccc” Yahoo! Group, and that the e-mail address [email protected], which Wang Xiaoning used to post e-mails to that Yahoo! Group, was also a mainland China-based account maintained by Wang Xiaoning. Defendants were cited in the court decision as instrumental in causing the Plaintiff’s arrest and criminal prosecution. Based on what I have read and re-read in the sentence handed down in 2003 by the Beijing Number One Intermediate People's court, there are a lot of unanswered questions. I am supposing that the plaintiffs have more evidence that will supply some answers, and which will come out in court if this suit does go to court, given that Wang's wife Yu Lin claims that "If Yahoo did not give out this information, then the Chinese government would not be able to sentence him.'' The lawsuit also claims that Yahoo! supplied the information voluntarily and not under subpoena. Point one, on the previous page, describes how Wang set up a Yahoo! Group using a couple of Yahoo! China e-mail addresses, but that eventually Yahoo! China administrators noticed the politically sensitive content of his postings and stopped him from making further postings to the group. 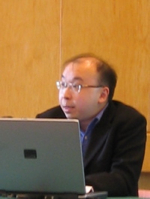 Point two describes the results of a search of Wang's home conducted by personnel from the Beijing City State Security Bureau, during which time they searched and confiscated his computer, identifying specific document files that Wang had been sending. Point three describes confirmation of a further offending document on Wang's computer. 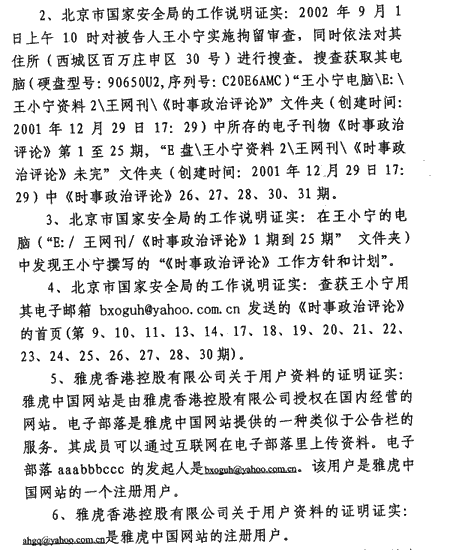 Point four says that the Beijing City State Security Bureau confirms that various of these documents were sent by Wang from the Yahoo! China e-mail account [email protected] They do not specify whether they determined the connection between Wang and this e-mail account from searching Wang's computer or confirmation obtained from Yahoo!, or both. Point five concerns specific actions by Yahoo!. It says that Yahoo! China is a website operated domestically in China by Yahoo! Holdings (Hong Kong). It then goes on to say that Yahoo! Holdings (Hong Kong) provided confirmation that the Yahoo! 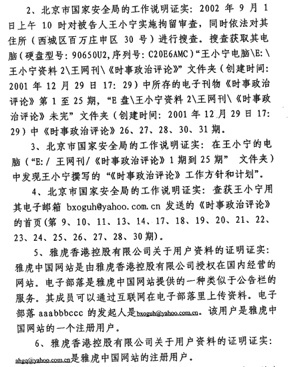 Group called "aaabbbccc" run by Wang was set up using the Yahoo China e-mail address [email protected] No further information is given in the judgment document about whether Yahoo! provided personally identifying information about Wang to the State Security personnel. Nor is there any information about the circumstances under which these State Security personnel obtained information from Yahoo!, from which employees they obtained it, and the extent to which the exchange of information was voluntary. Thus the mention of Yahoo! (Hong Kong) Holdings in the Chinese court document. Nevertheless, there is still confusion. The New York Times quotes Yahoo spokesman Jim Cullinan as saying: “Yahoo HK does not exchange info with Yahoo China or give information to mainland Chinese security forces.” That may be technically true at the moment but without further clarification that statement only serves to confuse the facts of the case further... and send journalists without detailed knowledge of these cases down a blind alley.